Arnott Mader - Call on Dolly! 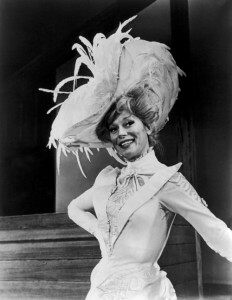 Terry DeMari hired Arnott Mader as a dancer for the original Carol Channing company which was already on the road (1966). They had been in Camelot together. He joined the company in Des Moines, Iowa. Dolly was “mid-career” for Armott. He had been with several ballet companies and Camelot prior to that. When he joined the company, it was right after the company had left Chicago with Eve Arden, and Carol had rejoined the cast after filming Thoroughly Modern Millie. 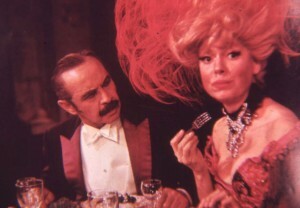 He loved working with Carol Channing. He did go on to say she was a little “odd” off stage at the time. Her eating habits are well known in most theater circles! She was eating “reindeer meat and having strange delicacies sent in from Finland.” On Monday night, no matter what city they were in, Carol and Charles (Lowe) would rent a movie theatre for the cast and crew to go see the latest movies. Armott’s thoughts on this production was that it was a wonderful production. This is the company that went to the White House to entertain Lyndon Johnson. Armott remembers that Gower was very pleased with the dancing in that company. Armott would spend the next three years with various companies of Dolly! 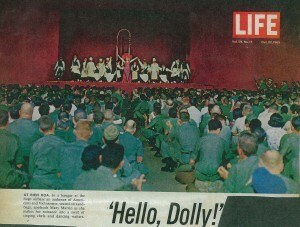 On May 3rd, 1967, Variety reported Miss Raye plans to make a return visit to “Vietnam next fall — “singing, nursing, clowning, whatever they want me to do” in Hello, Dolly! Arnott would end up joining that company. The dance captain from the New York company hired Arnott for that. 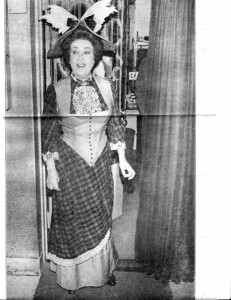 Sondra Lee, who originated the role of Minnie Faye on Broadway, was also in that company. Sondra was very close with Martha and stayed an extra three weeks after the show was over. Arnott said that Martha was not as popular as you might think, with the military brass, however, because she would keep the service men up all night. Drugs and poppers were prevalent at those all night parties and those men would be “nasty” the next day. She was fabulous on stage but rather selfish off stage. Audiences, however, loved her. 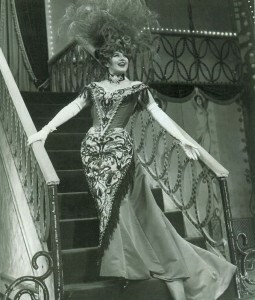 At the end of the show when Horace would say “Wonderful woman!”, she would get a standing ovation EVERY time. Armott said he cried every night at that moment. Armott tells me that his experiences of being in the Vietnam company with Martha Raye are among his favorite memories of Dolly! Soldiers would sit out in the rain to see this production. Some would be wounded and in bandages and they still sat in the rain. There would be very little in terms of a tent to protect them. At the end of the shows, they would be standing and screaming. “It was so unbearable sometimes, it was so wonderful.” They would stand around the dressing room and tell the company how thrilled they were to see people with “round eyes.” Armott says it was like being a missionary. He felt that he was a missionary when he did that kind of work. After leaving the Vietnam company, Armott went into the Dorothy Lamour company. He stayed with that until that closed. He also appeared in a dinner theatre production that starred Anne Russell. Armott tells me that his whole life was about being on the road at that time. Prior to Dolly, he was part of the Royal Ballet. He had spent six months in residence in London and other than that, they were on the road every two years. He loved being on the road. He slept on the bus, got off, and did a show. He doesn’t have anything against being on the road. It was a way of life for him. He is sorry to hear about those actors/dancers who are afraid to go on the road because of a fear of missing opportunities here in New York. Being on the road, there isn’t much time for “down town”. Dorothy’s tour, especially, was mostly one and two night stints. With Carol’s company, there would be one pick-up rehearsal with Terry every week. He would go to a movie once in a while in the afternoon and he very rarely did that. He considers him a great sight seer and when possible, would take advantage of that. He would go to museums and that sort of thing. 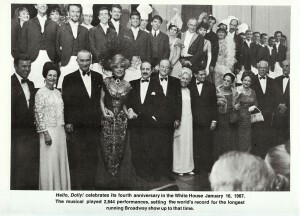 The first time that Armott saw Hello, Dolly! 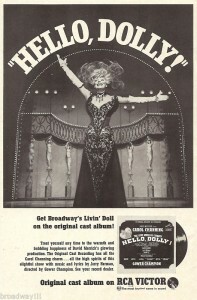 was the original company with Carol Channing, very early in the run. The day that the original Camelot company went out on the road was the day that auditions were first being held for Dolly! 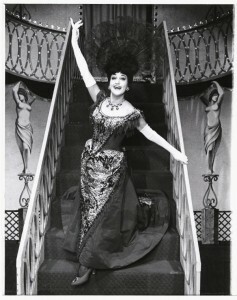 The dance captain from the New York company of Camelot who hired Armott was going in to audition for Dolly! that very same day! Lucia Victor, Gower Champion’s assistant, directed every production of Dolly that Armott did (including his one stint in summer stock). Armott tells me that Lucia had a great sense of humor. That is the one aspect he appreciated the most. He had actually met her sometime before when she was in Kansas City with the Mary Martin company. He was in Kansas City doing an opera. Interestingly enough, they were actually calling him in New York because he had auditioned for that company. He says he is a terrible auditioner. He was down to the final two they needed and he didn’t make it. Gower had decided against him. Lucia felt that he COULD do it. A guy was fired from the Kansas City production because he came across as too “effeminate” on stage. Lucia thought Armott would be the perfect replacement. She was surprised to run into him on the street in Kansas City after he had auditioned in New York City! That was the first time he “officially” met her. When he came into the Channing company, he had one week of rehearsals. He was with each of the Dolly companies that he was with until they closed. Carol’s company closed in June of 67, then he went away and did summer stock. In September, he was on his way to Vietnam. He came back in November and went straight into Dorothy Lamour’s company. All he remembers of his FIRST opening night was that he was very nervous. He knows he “wasn’t perfect”. 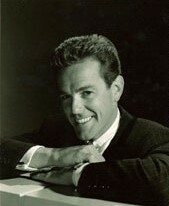 Terry deMari, being the dance captain taught Armott for the first company. He didn’t really work with Lucia until he was in rehearsals for the Vietnam company. He really felt that he was truly directed by Lucia when he did the summer stock production. 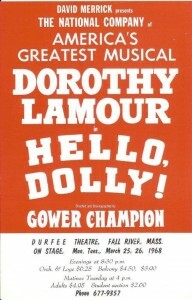 She always respected Gower’s contributions to Dolly! She would always say “Gower wanted this” or “Gower wanted that.” She was always very positive. He doesn’t remember her ever raising her voice. She was extremely quiet as far as he can remember. When he was in rehearsals for the Dorothy Lamour company, that production was directed by Lucia Victor and dance captain Jack Craig. Once again, the whole of Vietnam are among his most cherished memories. He remembers one particular performance where the soldiers sat in the rain watching the performance. At the end of the performance when they stood, their laps were dry! It made the entire company cry to know that these guys sat there in the rain for them. Once they were doing the show by the Cambodian border, all of their stage lights went out. At one moment, 15,000 flashlights came on. He says that is probably the highlight of his entire career. Working in Dolly, he just did his job. He knew nothing of the “politics” behind the scenes of any of these productions. He loved working with Dorothy Lamour. He was one of her “favorites.” After that company, he was at her home many times. They always got together when he was doing shows in Los Angeles. She would pick him up at his hotel and he would go to her house for dinner. He would read “parts” with her when she was working on television appearances. He said she was not a “clever lady.” All in all, he walked away from his Dolly experiences with a lot of wonderful memories. As a matter of fact, he doesn’t have any bad memories. I asked for his thoughts on all the Dollys he has seen outside of his own productions. He was in awe of Carol Channing (he saw her early on in it’s original production). He started out as a huge fan of Opera. Maria Callas was his idol. He would walk out of a Maria Callas feeling as if he were in “seventh heaven”. He felt the same way after seeing Carol Channing. Coming out of the theater, he felt as if he had been in another world. “It was incredible.” He said he could hardly remain in his seat during the Waiter’s Gallop, it was so incredible. He never saw Ginger Rogers, Betty Grable, or Phyllis Diller. He saw Pearl Bailey’s company when they were getting ready to go out with the Dorothy Lamour company. He saw Pearl Bailey the night before flying to Toronto for his father’s funeral. He remembers it being a Friday night. He was not terribly impressed. He was much more impressed with Carol and with Martha Raye (who he considers to be the best of ALL the Dollys he has ever seen). He didn’t really enjoy the film that much. He doesn’t know if having been in the show had any bearing on that. 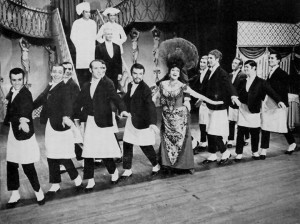 Several of the dancers of various companies were also the galloping waiters in the film.He doesn’t feel that the film captured the “presence” of the stage production. 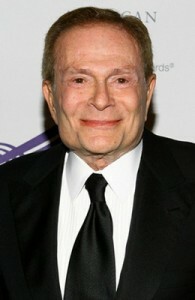 His thoughts on Jerry Herman is that he is a wonderful man. He met him the first time when they were appearing at the White House. There was one boy in the chorus who had gone to school with Jerry in Miami. Jerry had also seen this company when they were in Miami earlier. 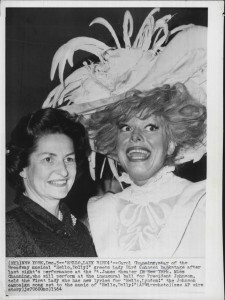 Five or ten years ago, Arnott went to a Jerry Herman concert and went backstage to “re introduce” himself to Jerry and “Jerry was just charming”. 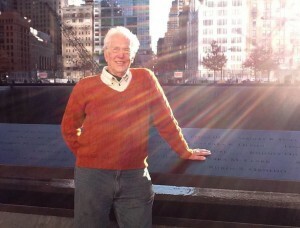 Jerry was eighteen years into living with AIDS and he talked about all the treatments he was going through. I asked Arnott how much of his personality came into the show. He said he did what Terry wanted. Arnott says Terry was a very strong dance captain. 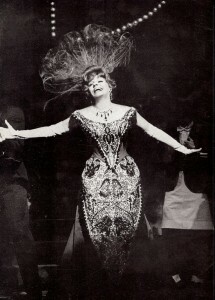 “He seemed to have eyes in the back of his head, as did Carol Channing.” Terry also gave notes after every performance. Arnott did not like the stage manager, Pat Tolson, very much. “He had a great ego and was as lazy as all hell”. The biggest change Arnott has seen in the theater since first doing Dolly! are ticket prices. Their salaries at the time were also very low. They were making $125.00 a week plus per diem. Technology has also become a major factor. Ghost, for example…Arnott doesn’t care much for the music but the special effects are spectacular. Same thing with Spiderman. We’ve gotten away from true “book musicals.” He enjoyed the “book” of Next to Normal but who can sing the songs? It’s not singable. He feels that only one production that he has ever seen of Dolly! didn’t hit the mark. Ironically, it was the last revival. He saw it at the Kennedy Center. He feels that Carol was “too old” and was being “too careful.” He didn’t feel the dancers did it with the same verve that he was used to. He didn’t enjoy that production at all. Arnott’s last Dolly was Anne Russell in Massachusetts and he has no recollections beyond that!